Asterix: The Mansions Of The Gods will be coming to a cinema near you in 2D and 3D from 19th August, and we've been lucky enough to have a sneak preview screening. A computer animated adventure movie with a voice cast that includes an amazing array of popular UK comedians from different genres, it promised big things and hasn't disappointed. My partner and I grew up reading Asterix books, but in recent years they haven't seemed so popular, and my young boys didn't know the stories at all. They do now! The cast really bring all of the characters to life and this is one of the funniest films we've watched this year. The deadpan Jim Broadbent as Julius Caesar and Greg Davis and The Centurion work really well against Jack Whitehall as Asterix and Nick Frost as Obelix. There is slapstick humour throughout, and this is an innocent movie, no-one dies or suffers horrific injuries, they're more likely to be attacked by a fish for singing too loud. The animation is good quality and exactly as you'd expect. A little larger than life, bright and familiar from the comic strip with clear, clean backgrounds to accentuate the characters. Movement is nicely illustrated, and characters have interesting faces with plenty of expression. The Romans want to remove the Gauls from their village, building a huge housing estate of gorgeous mansions nearby to overtake the village and force the people to become 'civilised'. They manage to get people to convert, and then not only do more Romans want to move in, but the Gauls want to live in the posh houses too, and have the Romans as their neighbours. It's all looking a bit risky for the future of the Gauls way of life, and Asterix and his gang try all kinds of tricks to deter the Romans from staying, which usually backfire. With the Gauls busy, the Romans see their chance to destroy the village, but are spotted. It's up to Asterix and his band to over-run them, allow everyone to return to their previous way of life and save the day. 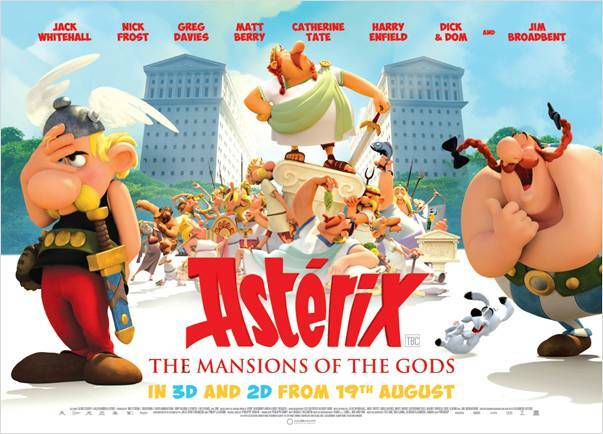 Asterix: The Mansions Of The Gods is released in cinemas in 2D and 3D on 19th August with a PG certificate (because of all the bashing and hitting with fish). Runtime 85 minutes.